In his 1966 campaign for California governor, Republican Ronald Reagan promised to "to clean up the mess at Berkeley." Reagan was referring to the unrest prevalent not just at the University of California, Berkeley, but on college campuses throughout state. Students and faculty alike were engaged in protests, demonstrations, and strikes related to issues such as the draft, civil rights, discrimination, and women’s liberation. In one 1966 campaign speech, Reagan declared that many leftist campus movements had transcended legitimate protest, with the actions of "beatniks, radi­cals and filthy speech advocates" having become more to do "with riot­ing, with anarchy" than "academic freedom." He blamed university administrators and faculty, who "press their particular value judgments" on students, for "a leadership gap and a morality and decency gap" on campus, and suggested a code of conduct be imposed on faculty to "force them to serve as examples of good behavior and decency." Six months after Reagan took office in 1967, he wrote this letter to Glenn Dumke, the chancellor of San Francisco State College, one of California’s largest public institutions. Dumke served as the public face of the state college system, and he was a staunch opponent of radical student and faculty demonstrations. In his letter to Dumke, Reagan criticizes liberal activism on campuses. He condemns "these people & this trash" on campuses as well as "the excuse of academic freedom & freedom of expression" in allowing protests and demonstrations to go on. 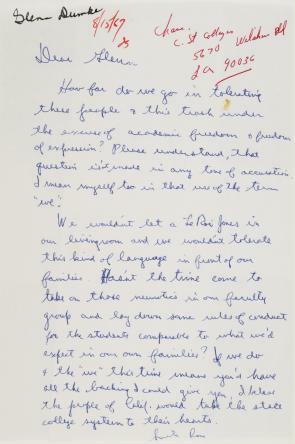 "We wouldn’t tolerate this kind of language in front of our families," Reagan writes of campus protesters. He urges Dumke to "lay down some rules of conduct," promising that "you’d have all the backing I could give you." We wouldn’t let a LeRoi Jones in our livingroom and we wouldn’t tolerate this kind of language in front of our families. Hasn’t the time come to take on those neurotics in our faculty group and lay down some rules of conduct for the students comparable to what we’d expect in our own families? If we do and the ‘we’ this time means you’d have all the backing I could give you, I believe the people of Calif. would take the state college system to their hearts. Ronald Reagan, "The Morality Gap at Berkeley," speech at Cow Palace, May 12, 1966, in The Creative Society, 125–129. Read the document introduction, the transcript, and the images of the letter. Then apply your knowledge of American history in order to answer the questions that follow. What role do you think the campaign for governor played in Ronald Reagan’s letter? Explain the type of action Reagan wanted Chancellor Dumke to take against students at San Francisco State College. Research student protest movements at the University of California Berkeley and Columbia University. How did these influence Reagan’s political position?